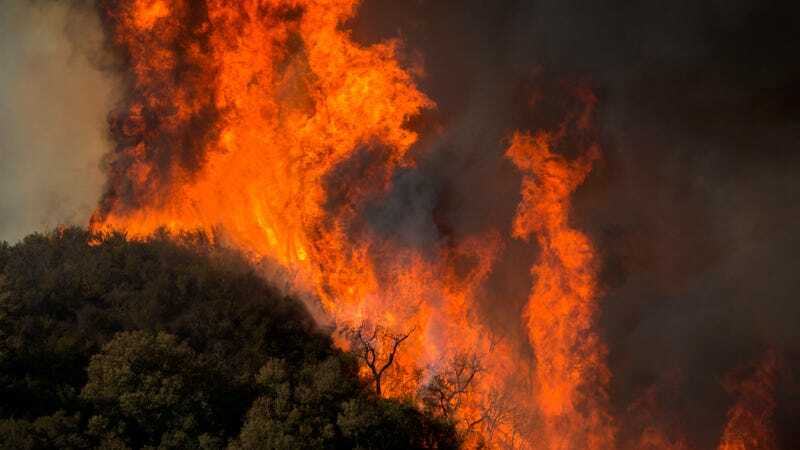 Flames from the so-called Malibu Fire in November 2018. For the first time in more than eight years, members of the House Committee on Natural Resources came together to formally discuss the impacts of climate change on Wednesday. Though the House Committee on Natural Resources was clearly divided down party lines on topics like energy production, most members could agree on the need to better prepare their communities to handle extreme weather events and natural disasters. The representatives mentioned hurricane after hurricane, wildfire after wildfire, all to note the increasing urgency of climate change. And, more importantly, the impact it’s having on people already. Panelists included Governors Roy Cooper and Charlie Baker, of North Carolina and Massachusetts, respectively, as well as non-government officials like Elizabeth Yeampierre, the executive director of Brooklyn-based climate justice group UPROSE, and Rev. Lennox Yearwood Jr., the president of civil rights group Hip Hop Caucus. A couple odd climate skeptics and industry sweethearts sat alongside them at the invitation of Republican members. Most witnesses were clear that climate change isn’t something for leaders to waste time debating anymore, but a problem that requires immediate action—especially to protect the low-income communities and communities of color hardest hit. Congress didn’t ask 16-year-old Nadia Nazar, who co-founded Zero Hour Movement, a youth-led organization raising the alarm on climate change through protest and activism, any direct questions, but she perhaps said it the best during her testimony. Nadia Nazar, 16, co-founder of Zero Hour Movement, sits before the committee February 6, 2019. “Humanity has pushed this planet to the edge, and from my view, it seems that few in the policy and political world are paying attention to the consequences of our actions over the generations,” said Nazar during her testimony, her only opportunity to speak. Now that more folks in Congress are finally paying attention, one might expect policy solutions to come up, but nothing concrete was recommended during this first meeting. There was, however, ample criticism to the not-yet-proposed Green New Deal. The idea, which is supposed to help transition the U.S. to a green energy economy with equity in mind, is still nascent, but the Republican committee members used this first meeting as an opportunity to attempt to delegitimize potential policy proposals, which Rep. Alexandria Ocasio-Cortez (D-NY) and Senator Ed Markey (D-Massachusetts) are set to unveil in the near future. A draft version of the proposal, which Bloomberg has obtained, reportedly includes mention of achieving 100 percent clean power but doesn’t explicitly call for a ban on fossil fuels. Other speakers, like Yeampierre and Yearwood, made clear they believe radical change like a Green New Deal is necessary if we are going to keep the impacts of climate change at bay. These witnesses emphasized that the specific policies will look different for different places. Every state’s energy portfolio varies, and every community’s need varies. Yeampierre was arguably the most outspoken during the discussions. She broke protocol time after time to ensure that her voice, as one of the two women of color on the panel (including Nazar, who was barely acknowledged), was being heard. She’d speak out of term, unapologetically. This was one of two hearings on climate change Wednesday; the other held by the House Committee on Energy on Commerce was the first in six years. This new beginning of climate change acceptance and discussion is a refreshing change from the days of the GOP-controlled House. The climate change meetings back then were not based on science or fact—but on lies and denial. At least that’s mostly changed. Let’s see how the rest of these meetings go.